During yesterday’s UFC 170 media event in Los Angeles the two UFC 170 headliners squared off for the camera’s in attendance. 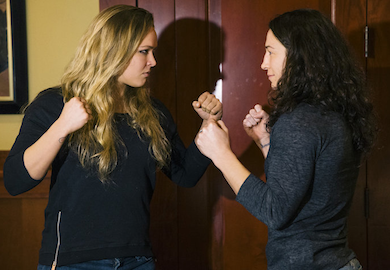 Ronda Rousey and Sarah McMann both boast unblemished MMA records with a side of Olympic medals to their credit. Ronda, the current UFC bantamweight champion, bronzed during her stint on the U.S. olympic Judo team and McMann took home Silver for the U.S. wrestling squad. Which olympian will bring home gold next month?